Tick tock, tick tock… the echo of the grandfather clock resounds in my ears. The room around me is dark, and quiet. So quiet I can hear the footsteps of a lizard on the wall behind me. On the bedside table, there is the last tablet. But I don’t need it now. Not for a few hours at least. I’ve adjusted; adjusted to the silence, adjusted to being alone with the morose stranger I see in the mirror. His bloodshot eyes stare into mine, the ones I am sure are brown and twinkling. They smiled, that’s what mom used to say. A shudder shoots up my spine. I hear more footsteps, bigger ones. They hurry past the room, to the source of the drip. Silence once again blankets me. The creak of the door tells me the caretaker is there, peering into the darkness. But he’ll not come inside. He’s afraid. They all are. He just wants to see if I’m agitated by the drop. I don’t think he can tell from there that I am. He’s new. His information on my background is sparse. The door creaks again as he shuts it. I want to scream. But I can’t. Did I forget to tell you? There’s a gag on my mouth. I can feel the beads of sweat as the drip into the corners of my mouth. I try frantically to reach the knot at the nape of my neck, but I can’t. My wrists are tied in front of me, and my ankles tied together. I crawl into a fetal position and wait. The door creaks open again, and my step-dad is there. He just wants to see my agitation. Perhaps, his crooked lips have bent into a sick smile. I don’t know what mom saw in him, to make him my step-father. Perhaps it was his money. We were poor, and struggling to meet ends. She was beautiful, and he fell in love with her. I was just the third wheel. One he wanted to remove, and tried to, sending me off to boarding school. Except the time we went on vacation, for a cruise on The Lantern. Mom and I were united then. Every time I close my eyes, I see her. I want to ask her why she chose him. She’s on the deck, lounging in a chair, wearing her favorite white bikini. She wants a tan before we return home after our cruise. The Lantern is not very big, but it’s ours. She looks at me, and smiles. She reaches beside her for the book, and asks me to read to her. She likes when I do that. I have a flair for the dramatic, she says. On either side of us, two men stand in uniform; black, with their names on them. There are others like them around the yacht. Mom asks me to sit next to her. She takes me into her arms, and holds me tight. “Wish I could never let go of you,” she says. There’s a blast, a loud one. Mom puts her hands on my ears, but there’s no sound, other than that of feet, as the passengers run helter-skelter. A plume of smoke rises from the level below. Mom pushes me to my feet, toward the railing. There’s another blast. Impulsively, I throw myself overboard, landing hard into the shaken waters around us. But she doesn’t. In the moment, I forgot. She can’t swim. She stands there, staring at me, me staring back. She has given up, I can tell. I call to her, tell her to jump, that I’ll hold on to her. But she doesn’t hear. I can see the fear in her eyes. “Die drowning, or die in a blaze?” that is all she’s thinking. I hear a motorboat start on the other side. It comes toward me. He pulls me aboard. “We’re saved!” I shout, looking at mom. But the motorboat just speeds away from the yacht. “No. Don’t. Take her too. Please,” I plead with him. But he doesn’t listen. I hear the third blast. I turn to see the flames where mom had stood just a moment ago. I jump out of the boat. But my limbs fail me. By then it is too late. Only the cold waters of the sea crowd around me. My mouth is open in a silent scream, unable to believe what my eyes have seen. Every time I close my eyes, I open them, screaming. I remember the aftermath. Was it an attempted murder against one of the most influential people in the country, my step-dad? No one could tell. There were no witnesses. I wanted to shout out loud, that it was my step-dad who was behind it all. But the cops were on his payroll. They wrote me off as insane from PTSD. I became afraid… of him, of the open water that had swallowed me as I watched the burning Lantern, and slowly afraid, of water. Every day, there’s a pill on my bedside table. One day, it makes me sleep. Sleep with the memories, relive them over and over till the pill wears off, and I wake up screaming into the gag. Another day, it keeps me awake. Awake with the fear, shivering each time I hear a drop, one that he makes sure happens. He kills me by keeping me alive, making sure I am too afraid to talk if any investigators not on his payroll arrive on his doorstep asking for co-operation. But the pill tonight is different. It looks different. The door creaks open, and he stands there. “This pill makes it all go away,” he tells me. I eye it eagerly, and he watches me for a while. He then keeps the glass next to it. I curl up again, turn away at the sight. The door creaks as he walks out and shuts it. Only the silence remains; silence, and his laughter. This fiction post has been inspired by three words given at the Three Word Wednesday meme, and also by the image given at Magpie Tales this week. The three words at 3WW are Morose, Sparse and Impulsively. 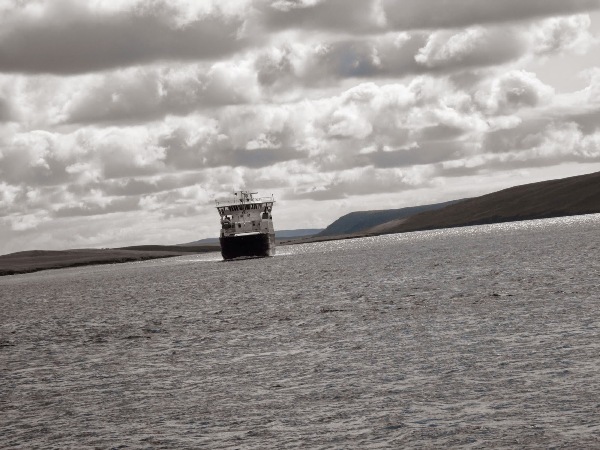 The credits for the image at Magpie Tales belongs to R.A.D Stainforth; the photograph is of the Yell Sound, Shetland, and it was taken in 2014. Trauma and fear. Bad combination especially when someone wants you tortured. Yes, bad combination, but the first causes the second. Especially when there is hatred involved too, Jb. That was a wonderful narration! Sad. Even to make an escape out of his misery he cannot drink water. I know. It is sad. Thanks, Ishi. Wow, that was quite a powerful piece right there. Very well narrated, I could see the scene happening in front of me. Thanks, Jairam 🙂 Glad you could see the scene. A very powerful piece. Well done. I don’t know what to say.. so, im just telling you that I read it. Loved the narration. Good job, Leo 🙂 I could feel the anguish that was flowing through your words. Thank you, Aathira 🙂 Glad you liked the narration!